Image caption A promising alternative to spending hours in traffic? Jakarta has begun commercial operation of its first metro line, with many hoping it will ease the notorious traffic in Indonesia's capital. The new MRT is a significant step for Indonesia's capital where there have been discussions about an underground metro dating back to 1985. But those mass transport systems have failed to become the first choice for Jakarta residents. Only 20% of Jakarta's population use public transportation for their daily commute. The director of Jakarta's new MRT Jakarta told me that shifting people from private cars to using the MRT will be a real challenge. He's also urged the Jakarta metropolitan government to issue some regulations that will force residents to leave their cars and motorbikes at home. In other words, Jakarta's metro cannot be the only solution to the heavy traffic problems. Parking tariffs and car sales tax should be increased, and there should be a toll road system, experts have said. Which city has the worst traffic? The projects are part of a large push that President Joko Widodo hopes will improve Jakarta's infrastructure, and boost his popularity ahead of national elections on 16 April. 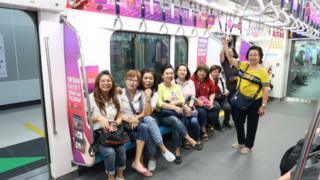 "This is my very first time to use Jakarta metro service," passenger Budi Sukmono told the BBC. "I took a day off today so I could bring my family to experience this." "I usually do my daily commute on my motorbike. I think I could spend less money if I use the metro - fuel prices keep increasing these days." "While the metro is clean and comfortable, I haven't yet decided whether I will use if for my daily commute," passenger Maria Wace told the BBC. Video Which city has the worst traffic?